Facebook Hacking incidents are growing these days, and even I ignored securing my Facebook Account until I met the same. Hackers can now crack your Facebook account online using free tools. And yes, I got one of my Online Facebook Account down yesterday. I cannot mention that here, but just want to say that they have changed the password, and the e-mail too. Thankfully Facebook has taken steps to help prevent hackers, you can choose two factor authentication and set up an extra layer of security for time that you login from a different computer or location. The extra layer or “token” as it’s called in technical terms requires an added measure of authentication before it will allow the user access. Even with all the security options, your Facebook account is only as secure as you make it. If you don’t choose their security options, they are not activated on your account. I learned this the hard way. It was one of the official facebook account of one of my previous blog, I just recovered it today, and to be very honest, when I tried a lot of times with the password and when it didn’t logged in me up, I thought I lost that account. But the one who hacked up my account, forgot to change the Phone Number which I added up for getting notifications, and that way I got my account back. Just after logging in my account, I changed up the password and added and enabled every security options. I recommend you to enable all these security measures mentioned below otherwise you will have no recovery option in case your account gets hacked. Below are some of the most suitable things you should consider if you want to make your Facebook Account Secure. Do it before you experience the situation. This is the first and most important part of your Facebook Account, and the part which only allows you to see your account and nobody else. You will loose all your account, all your data and everything if someone knows your password and he gets into your account, change everything. So better keep the password which only you can remember. I noticed a lot of times this thing, even in my college labs, I see most of the students just cut the tabs without logging out their account. Most of them close the tabs, even then some doesn’t which helps others to look into their profiles. And definitely, you don’t want to loose your privacy. So, what ultimately I am trying to say is never login into facebook account from your college network, internet cafes and other such public places. If accidentally you let your account signed in, then you would be in trouble for sure. Other thing I noticed is that while we login from Facebook’s Homepage, and while typing username and passwords, sometimes when yo utype your password, the cursor moves to the username section and you type your password without seeing where actually you are typing. So, keep this thing in mind too, otherwise someone in the neighborhood can see your password. Adding your phone number is another way to secure your Account. And why not, atleast it helped me recovering my account back. Don’t know how it actually works but I recommend you to Add your Phone number. 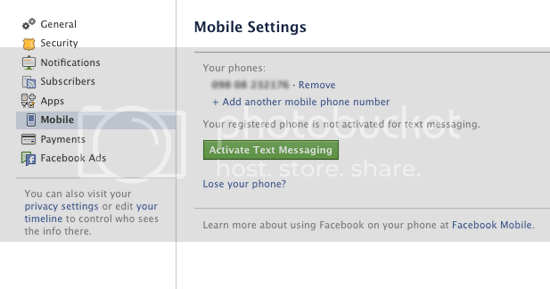 By activating your phone number, you can also get the latest information of the IP address logged in your Facebook account. You will also be notified of the place from where your Facebook account is accessed on your phone via messages, so you can have a look if its you or somebody who logged in your account. Open up your Facebook Profile and then on the top right, from the dropdown of your profile link, open Account Settings and then open up the Security Link from the left sidebar. Facebook will show up some security options that you need to enable for better security for your profile. One of them is mentioned above, that is, adding your phone number. First one in the list is using the HTTPs version, that is secured version of Protocol on Facebook. It is very important for you to check the “Active Sessions” section. These are the locations from which your account is being accessed, and it will help you if there is any other unauthorized access to your account. Above is the quick guide on how to setup your security features section on Facebook from Kaspersky Lab. Hope you would find it useful. You can end up all those active sessions which you find are not from your side or the sessions which are from different locations. Not only above things, we have a list of other factors that matters too. Is Your Facebook Account Hacked ? If your Facebook Account has got hacked and if you are not be able to get it back in any way. Don’t worry, you can contact facebook directly for this and they will help you out for sure. You can contact facebook if your account is hacked and let them know this situation of yours. Finding suspicious app at fb is really hard. Many times inbox get flooded with spam mails. Pretty useful tips to follow and keep the facebook experience safe and secure. Users should have idea about security to prevent being victimized. Yup, I have experienced this, don’t where the loophole existed, even though, you need to be secure for sure. Thats why everyone should add their phone numbers. Good tips admin, now days there is no safe social networking website, anyone can hack our account easily . 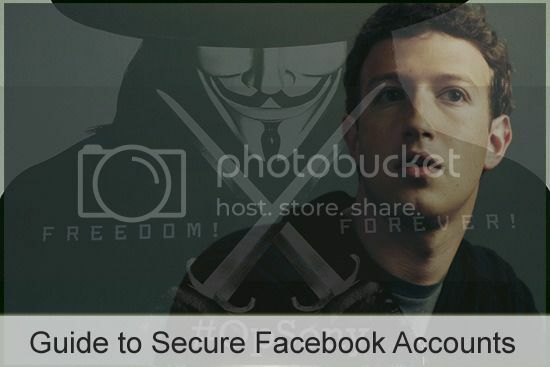 You share really nice tips to securing our Facebook account . Thanks for Sharing this Information. We must add our Phone Number and must change our Passwords regularly. Its will really increases our Account Security.